In a city like Amsterdam everyone rides bikes, young or old. The City of Edmonton has a growing number of bicycle riders that it wants to support for all kinds of reasons. However, initial attempts to build out a network of bicycle lanes have encountered resistance from some communities. So much so that Ward 10 Councillor Michael Walters made a campaign promise to have a meeting about the newly-installed lanes in his ward within a month of his getting elected. The thing is, as I argued in a recent post, the painted, on-street bike lanes don't offer much to new bike riders, those not already engaged in the activity. 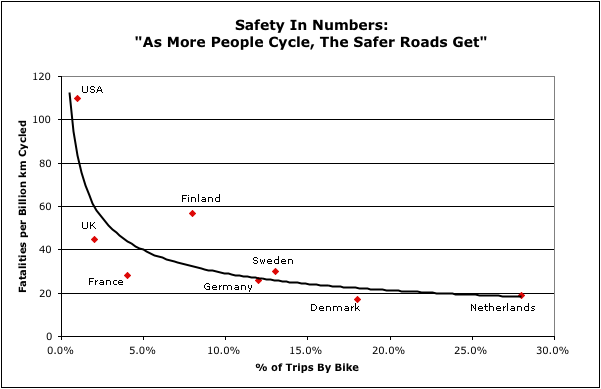 They do increase safety for those on the road by 50% (source). However, most people do not want to share the road with fast-moving vehicles. So the current strategy, in my opinion, will not provide us with the breakthrough in ridership that our city needs to increase livability and offer the high levels of safety provided by large numbers of bike riders on the road. The city has already decided to prioritize the construction of major bike routes on 102 Avenue and 83 Avenue. This is a step in the right direction, as those routes are high-quality infrastructure (not just lines on the road), and they are located in dense areas where ridership is already high. However, I would like to propose an even more aggressive strategy. I think that we should "Amsterdam" neighbourhoods, one at a time, to create a critical mass of infrastructure in these dense, bike-friendly areas. These neighbourhoods would become showpieces and destinations. They would fill up with bikes, and their success would be obvious to critics and supporters alike. This strategy would create truly safe biking environments, and it would create space, politically-speaking, for more infrastructure elsewhere. Strathcona Centre, arguably the cultural heart of the city, has 10,000 inhabitants, 5% of whom bike to work most of the time (with a much higher percentage making bike trips for other reasons). Furthermore, it is surrounded by the city's other highest percentage biking communities (Belgravia, Mckernan, Ritchie, Park Allen, Queen Alex, Garneau, and of course Strathcona itself are in the top 10). It is the epicentre of cycling in Edmonton, and it should be our pilot project for Amsterdamming neighbourhoods. I spent the summer cycling with my family in Europe. It was our first time riding in cities that take bikes seriously, and it was a real treat. From Utrecht, Holland to Strasbourg, France to all of Belgium, we had had no idea how transformative it is for a place to be filled with quiet, safe bikes. And do you know what we never saw? We never saw good infrastructure that wasn't filled with people riding bikes.